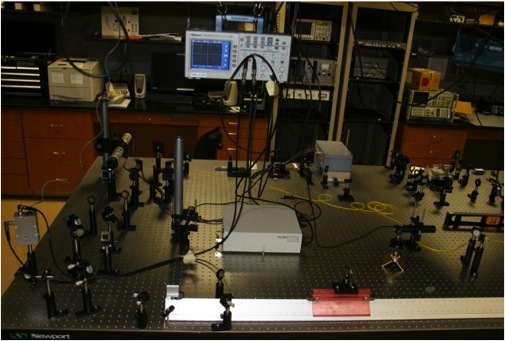 Wavelength meters are useful tools for precision atomic and molecular laser spectroscopy. A wavemeter, or lambda-meter, with relative measurement uncertainty of a few parts in 106 facilitates searches for spectroscopic lines and their resolution. As an example of the scale involved in spectroscopy experiments, common laser systems such as external cavity diode lasers (ECDLs) often have continuous tuning ranges of over a gigahertz. At 780 nm this is 2 pm (Δλ/λ≈3x10-6). Narrow-linewidth diode lasers can resolve nearby spectroscopic lines such as the two transitions for cooling and trapping 7Li, which are separated by approximately 800 MHz (1.2 pm at 671 nm). Wavemeter: the HeNe reference laser is at upper left, beamsplitter at lower left and corner cube is on air track glider. Commercial wavemeters can be relatively expensive, particularly in the context of experiments in undergraduate labs involving low-cost laser sources such as ECDLs. This Immersion will demonstrate results from a home-built wavemeter with accuracy and precision rivaling those of commercial systems—sub-picometer accuracy and resolution—but built with relatively low-cost components such as a common introductory physics laboratory air track and glider. Participants will build their own wavemeter in a Michelson interferometer design. The apparatus will comprise a stabilized helium neon laser, frequency counter, standard optics such as mirrors, lenses and a corner cube, and an air track. The participant will make wavelength measurements of various laser sources. 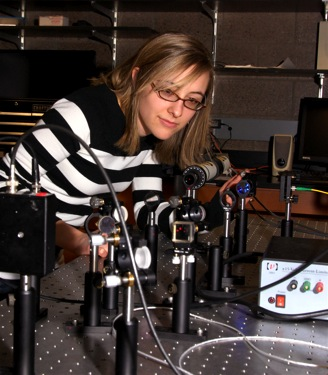 BU alumnus Sarah Anderson aligns wavemeter. Shown are reference HeNe, beamsplitter and detector. The Immersion will proceed from a brief introduction of the main ideas of interferometry, coherence and wavemeter uncertainty to constructing a wavemeter. The final day of the workshop will provide an opportunity for measurements or to connect with one of the other concurrent Bethel ALPHA Immersions.